Manor College is pleased to announce three students in the Allied Health Program have been selected as semi-finalists for the Jack Kent Cooke Foundation Undergraduate Transfer Scholarship for transfer students. Approximately 2,400 students from across the country applied, and only the top 20% are chosen as semifinalists. The finalists will be selected in April, 2018. 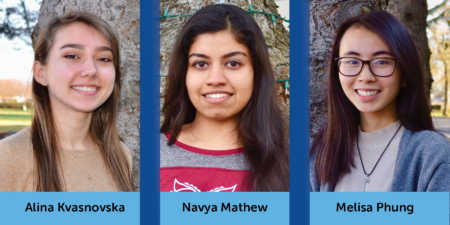 The three students are Melisa Phung, Alina Kvasnovska and Navya Mathew. Phung is a Radiologic Sciences Transfer student who plans to transfer to Thomas Jefferson University to attain her Bachelor’s Degree. She is active around campus and has over a 4.0 GPA. Due to the many sciences and honors classes Phung has taken at Manor – her GPA is currently above a 4.0. Kvasnovska is currently studying in the Nursing Transfer program and has maintained above a 4.0 GPA with the hopes to transfer to Thomas Jefferson University upon graduating from Manor in the Spring semester. As an immigrant from Ukraine, Kvasnovska, connects with the mission and heritage of Manor College and is not only an outstanding student but very active in many charitable causes. Mathew, yet another outstanding student with an above 4.0 GPA studying in the Nursing Transfer program has her goals set on transferring to Holy Family University to continue her nursing studies. In 2016, Manor College alumni Isla Martinez-Iglesias, received the scholarship and now attends La Salle University, studying pre-medicine. Manor College is extremely proud of these students and is thankful for such dedicated faculty that help educate the college’s students.